When you take a look at the Kia Sorento 2011 and the Kia Sorento 2010 you might think that the 2011 model is a totally different car. With a more firm unibody structure, powerful engine and more interior room it is a major competitor among its class of SUVs. For 2011, Kia Sorento adds another trim level called the sporty SX to the previous base, LX and the EX models. Typical among all the trim levels is the two-wheel drive. All-wheel drive is available for the LX and EX model. For the 6-speed manual transmission base model, typical features include a tilt/telescoping steering wheel, seventeen inch alloy wheels, satellite radio audio system with CD/MP3 player, trip computer and Bluetooth connectivity. For the LX model, it has a 6-speed automatic transmission, second row seat armrest and heated exterior mirrors with same color of the body. It also has an optional package that has heated front seats, rear parking detectors, a rearview mirror fitted with a backup camera, roof rails, LED turn signals and fog lamps. The EX model is an upgraded version of the LX with additional features such as the automatic dual-zone climate control, keyless ignition, eighteen inch alloy wheels, leather seats, ten speaker audio system, sunroof and a traffic navigation update in real time. The 2011Sorento comes with a 175 horsepower 2.4-liter 4-cylinder engine. The EX model comes with a more powerful 276 horsepower 3.5-liter V6 engine. All the trim levels have a 6-speed automatic transmission except the base model which is designed for a 6-speed manual transmission. According to Kia, the fuel efficiency for the front wheel models is estimated at 21 miles per gallon in the city and 29 miles per gallon on the highway. For the AWD models fuel efficiency is estimated at 21 miles per gallon in the city and 27 miles per gallon for the highway. For the V6 front wheel drive fuel efficiency is estimated at 20 miles per gallon in the city and 26 miles per gallon on the highway while for the AWD fuel efficiency is estimated at 19 miles per gallon within the city and 25 miles per gallon on the highway. Interior design for the 2011 Sorento is top-class. With the comfortable front and second- row seats being a standard for all the trim levels, the EX V6 comes with a standard third row seat. This increases the passenger capacity to seven, two up from the normal five passengers in the other models. With all seats in use, the cargo space for 2011 Sorento is around 9.1 cubic feet. When the third row seats are folded, cargo space is about 37 cubic feet and 72.5 cubic feet with the second and third row seats folded down. Standard safety features for the Kia Sorento 2011 include: stability control, side curtain airbags, front-seat side airbags, antilock disc brakes, hill assist control, hill descent control, and an electronic brake distribution. 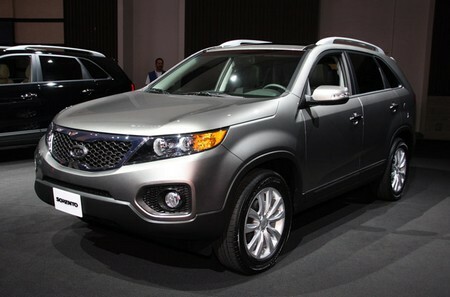 The Kia Sorento 2011average price ranges between $20,971 and $28,797.